At Least 100 Dead In Tanzania After Ferry Capsizes On Lake Victoria The search continues for survivors from the ferry, which reportedly was carrying several hundred passengers. Rescue workers are seen on Friday at the scene where a ferry overturned in Lake Victoria, Tanzania. At least 37 people have been rescued, but reports suggest the MV Nyerere may have been carrying as many as several hundred passengers. It was reportedly traveling between the Tanzanian ports of Ukara and Bugolora Thursday afternoon when it sank. 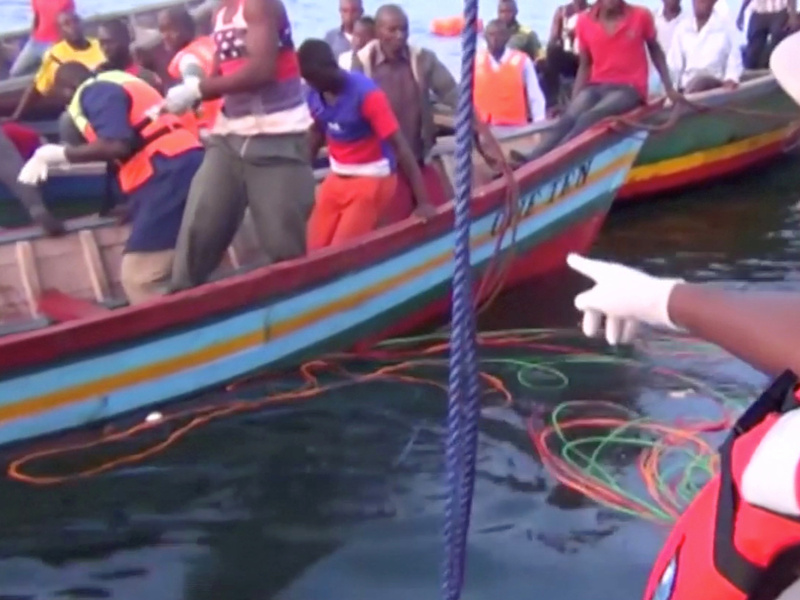 The boat was only 50 meters (164 feet) from a dock when it capsized, Tanzania's The Citizen newspaper reports. Citing a local district commissioner, the paper says the ferry has a capacity of 100 passengers and 25 tons of cargo — but it may have been carrying more than 400 people. There was confusion about the number of passengers on board, because the person who dispensed tickets was among the dead, according to Reuters. The ferry may have capsized when passengers moved to one side as it prepared to dock, some reports suggested. A search for survivors and victims was called off late Thursday and resumed on Friday morning. The office of President John Pombe Magufuli released a statement saying he is shocked and saddened by the accident, and that he is praying for those who were on the ferry. "Nimeshtushwa na kusikitishwa sana na ajali ya Mv Nyerere,nawapa pole wote waliopoteza ndugu na jamaa zao,nawaombea wote walionusurika kupona haraka.Kwa wakati huu nawaomba wote tutulie wakati juhudi za uokoaji zinaendelea." According to The Associated Press, "Accidents are often reported on the large freshwater lake surrounded by Tanzania, Kenya and Uganda. Some of the deadliest have occurred in Tanzania, where passenger boats are often said to be old and in poor condition."